of demanding bass players. The Bass Master is a compact “Bass Sound Machine” which enables the bass player to obtain superb tube tone with the utmost of ease. The tone controls are very effective and precise, and the boost functions offer instanteanous access to several fundamentally different kinds of bass sound. A full complement of connecting jacks make the Bass Master ideal in a broad range of applications from rehearsal to studio to stage. For those not familiar with the Bass Master, there is a pre-amplifier solid state input buffer/gain stage followed by a double triode (12ax7) with bass mid and treble boost switches and a dual tone control (one knob that performs bass boost in one direction or treble boost / bass cut in opposite direction). The Bass Master preamplifier feeds into a hot EL84 valve single-ended 5W power amplifier stage from which you can either take the output and put it into a speaker for practice (too quiet mostly) or have some of the signal bleed off into a buffered line output. The power stage can also be bypassed giving 12ax7 pre-amp only coloration. 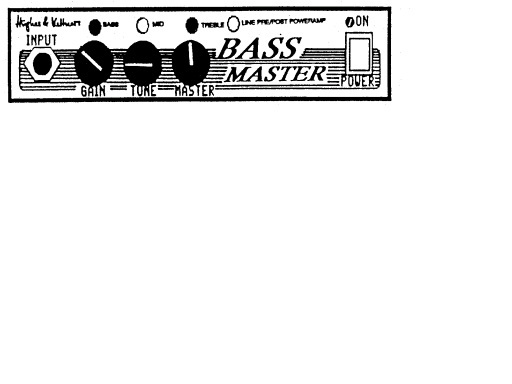 The Bass Master is a very intuitive bass preamp/recording amp. There is a gain knob and a master knob, as well as a general "tone" knob. You can get a huge range of very usable sounds just by turning these knobs. It also has three boost buttons (Bass, Mid, Treble) that do exactly what you expect. There are several different outputs, depending on whether you are running it into a mixer, amp, etc. When recording, you can run through the EL84 valve power amp or bypass it by pushing a switch. Two input jacks, on the front and one at the back. automatically disconnected when the front panel jack is in use). The gain potentiometer controls the input level and thereby the sound characteristics of the preamp tubes. At low gain settings the Bass Master imbues the bass with warmth and fullness, and at medium levels delivers a fairly raw rock punch. From center settings onward, depending on the output level of the instrument itself, the preamp tubes add more and more harmonic distortion, thus intensifying the sound of the bass with characteristic tube overdrive. Affects the overall output level of the signal at the LINE OUT and INSTRUMENT OUT jacks (assuming the TUBE/BYPASS switch in the back of the unit is in TUBE position), but does not affect the PA OUT, which remains a constant line-level signal, nor the SPEAKER volume of which is controlled soley by the GAIN. The control labeled TONE is a “one-knob tweaker” which can sweep the entire frequency range from powerful “cellar-bass” to the most transparent highs. The three black pushbutton-switches for Bass, Mid, and Treble, are specially contoured to offer a dramatic amount of tonal control instantaneously. This control is useful for slap bass players and also suits horn equipped bass speaker cabinets. The TREBLE boost switch in combination with the TONE control is capable of producing some extraordinarily bright sounds. Think Mark King "Level 42, " Flea "Red Hot Chili Peppers," Peanut "311," and Victor Wooten. With this switch, to the right of the three boost switches, you can select whether the signal appearing at the LINE OUT jack is tapped immediately after the preamp tube, or whether it goes through the power amp tube as well Your choice will have a considerable effect on the overall sound. By fine tuning the GALN and MASTER controls while using alternate settings of this switch, you can uncover further sound variations, from clear, to gritty, to growlly, to all-out overdrive. This switch on the back of the unit will normally be set to TUBE. The LED next to the INPUT on the front panel will confirm this by being illuminated in tube mode and dim in bypass mode. In normal operation the signal runs through the tube section and appears at the LINE OUT, SPEAKER OUT, PA OUT, and INSTRUMENT OUT jacks. In bypass mode, the PA OUT jack is inoperative, thus allowing the player in a live situation to tune up or swap instruments easily, without the change-over being heard by the audience through the house system. The TUBE/ BYPASS function can also be switched using a conventional on-off foot-switch. The Bass Master - Bass Advanced Tube Technology possesses a versatile array of jacks making the Bass Master at home in every conceivable situation, be it stage, studio, or practice. PA system is being used. The PA OUT signal delivers a constant LINE LEVEL SIGNAL and is therefore unaffected by the MASTER pot setting. However, gain, tone control and boost functions are still operative. When the TUBE / BYPASS switch is in BYPASS position, the PA OUT jack receives no signal, thus making it convenient to tune, or change basses. 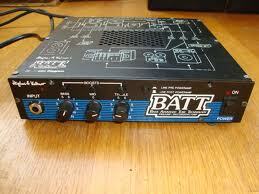 Used to feed the power amplifier when the Bass Master is acting as a pre-amplifier in a complete rig. 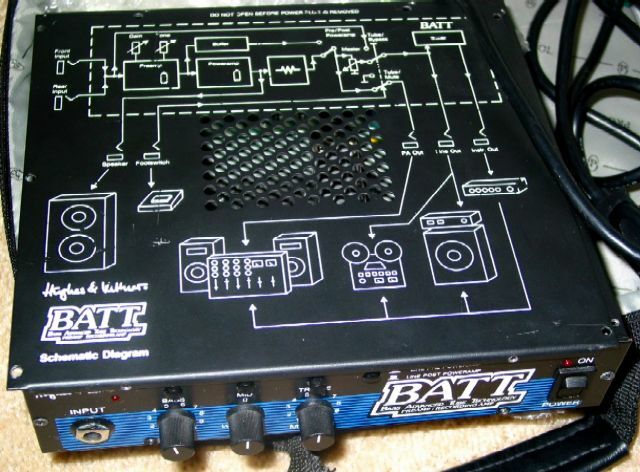 The output from the Bass Master is connected to the input of the power amplifier, and the output of the power amp is connected to the speaker cabinet. 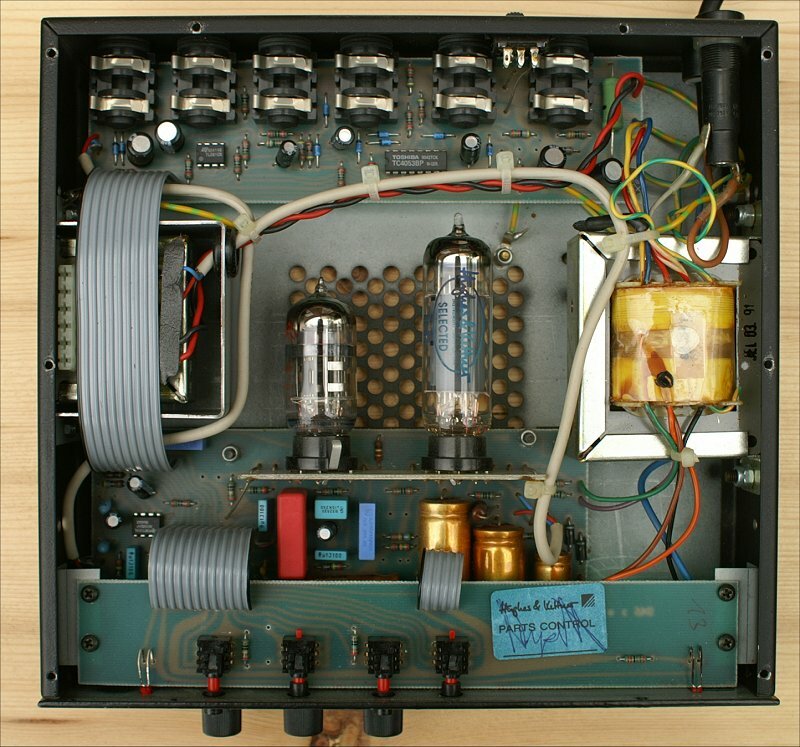 an external preamp, although it is important to ensure correct level matching. 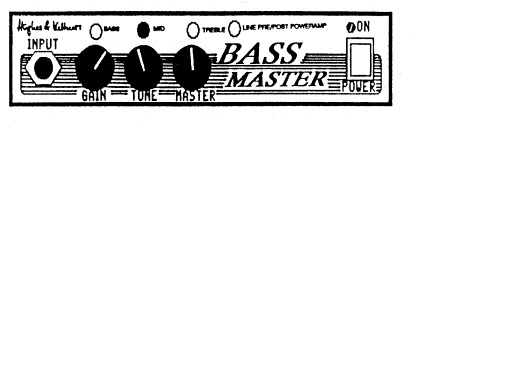 The INSTRUMENT OUT is designed as a signal path for connecting the Bass Master to an external amp or preamp, or for connecting two Bass Master preamps together. In TUBE position, the GAIN / MASTER section and the tone controls can be used to control the signal. In BYPASS, the signal is preamplified but unaffected by the tone control setting. To feed a signal directly from the Bass Master to a line input on the mixing console or recorder, you have a choice of three outputs: the PA OUT (in which case the signal level is independent of the MASTER volume setting), the LINE OUT, and the INSTRUMENT OUT. No space or volume problems, no miking hassles, just full-bodied sound is available in an instant. The Bass Master can be used as a stand-alone preamp or as an extension to an existing system. Hughes & Kettner offer special single and twin adaptors to faciliate 19” rack mounting. A STAGEBOARD is optionally available for easy on-stage switching of two units (Unit1 / Unit 2 / Bypass ). A jack for connecting the STAGEBOARD, designed to faciliate on-stage switching between different sounds such as two different Bass Masters. The INSTRUMENT OUT socket of the first unit is connected to the INPUT of the second. The second unit‘s LINE OUT jack is then used to control the amplifier/speaker combination for the stage sound. The PA OUT signal of each unit can be connected to a separate channel on the mixing console, and the STAGEBOARD connected to both canswitch between the two. It has nice glassy clean sounds, and really "warms-valves" up a sound if you use it on a cleanish patch on a multi-fx, as an insert, it makes the difference between a practice-quality sound and a finished-recording studio-sound.